my little red suitcase: food for the weekend and more cushions! food for the weekend and more cushions! Oh the ease of summer food. This will keep me going all weekend. 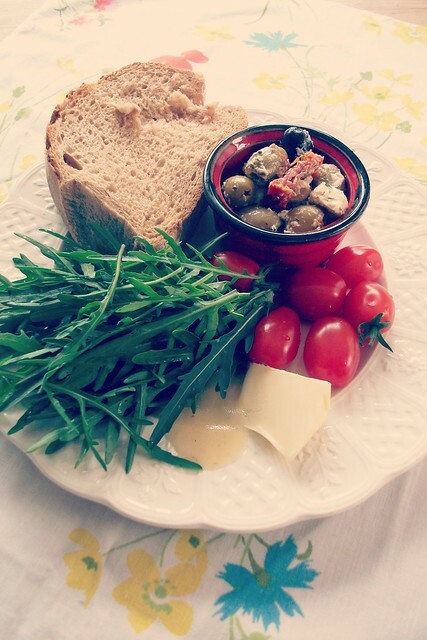 A trip to the farmers market, a chunk of fresh bread, olives, feta and sundried tomatoes. Add some sweet, juicy, organic tomatoes and a large handful of spicy rocket from the floor of my greenhouse, where it grows with abundance! So simple. My kind of food. It leaves more time for all the things in life which call 'right now'. Eaten in any sunny corner which beckons. I love the way my life expands out into new corners of my world and a sunny meal or a spontaneous chat with a friend calling by can take place in a comfy sunny spot! So good. This week I've actually been sleeping in my conservatory, under the stars, kind of!! The air feels fresh, I feel more connected to the outside. I wake up with the dawn chorus and fall asleep as the last glowing light leaves the sky. What can I say, it feels more real, I feel more in the world. It's a little like glamping in your own house! I wonder if you ever camp-out in your garden or sleep anywhere different in the summer? and wouldn't a summer house be great! for adults!! I have added my finished cushions to my shop. Here they are in all there glory! I really enjoyed making these. My mind is already racing ahead to new ones and I have some new things to show you soon. 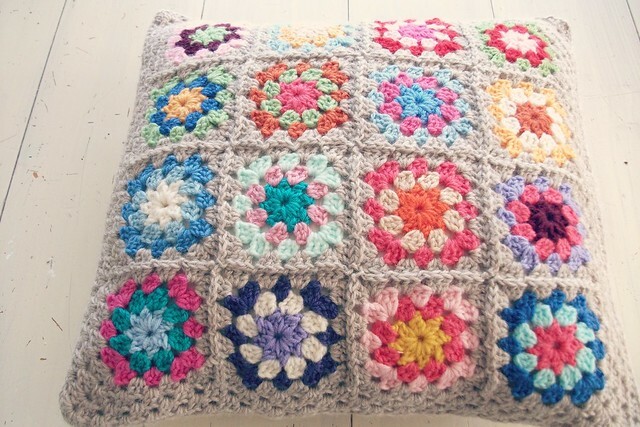 Here is my summer cushion. And here is my new biscuit cushion! Enjoy the weekend, enjoy some simple summer food, create something you love! relax!! The husband/father of a family I spent a few weeks with many years ago always spent the summer sleeping in the barn! I haven't tried anything like this, though we are planning to sleep on our little boat this summer sometime - it doesn't have an "indoors", so it will be open-air and adventurous ;o!! By the way your perfect lunch is mine too. Olives, tomatoes - all that lycopene and mediterranean goodness. Yum! .....I need to buy some yarn and hooks, because here in Italy I don't have anything to work with.....!!!!! My favourite types of food at this time of year ... Yum! Oh Heather, I could eat that plate of food right now - so long as the bread is gluten-free, but I don't think it is? Your camping sounds so peaceful and relaxing - and right! What a beautiful thought! Love your cushions and their gorgeous colours! We always do simple lunches in the summer as well. I have fond memories of eating sandwiches on the boat. Sometimes it's just too warm to want to run the stove! Love your cushions! 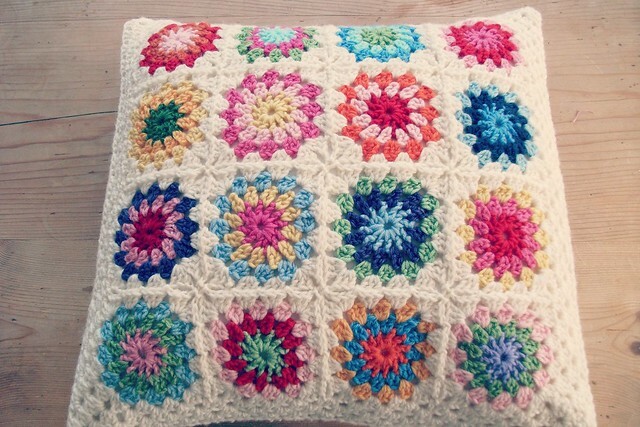 Haven't made granny squares in 20 years and now I'm going to make some with my scraps. Thank you for the inspiration. Hi Heather,We have a little veranda at our bedroom and we sleep right at the open door!! !Have to have a security door,not for any other reason but to keep the wildlife out!! !Monkeys can cause chaos if they get in!! !But we are past mid winter and still the door is open!! !Cool but not cold!! !We often lie out on a blanket and stargaze and would love to stay there all night but not on a game farm!! !The game love to come into our garden at night (They just break the fence)when it's quiet!!! (Oh my poor flowers)Our dogs Dozer,Lola and Brandy sleep inside too,because of the game!!! !Love Summer foods!! !Add some fruit and I could happily live on foods like that!! !Love your cushions!! !Happy and bright!! !Have a great day!!! !Stay happy and keep on crafting!!! your summer meal platter is just what I love too & sleeping under the conservatory ... even better ~ that sounds amazing.